It's been a couple of years since we've touched Miles' big boy room. We basically decorated it when we moved him out of the nursery, and haven't touched it since! Well, now that we will be moving Leo in there soon, we are putting some last finishing touches on the room. In terms of what we want to do next, we recently ordered two of these beautiful Millbrook Iron Beds from RH Baby & Child! I've had my eye on them forever and just love the classic style. I think they will go perfectly with the room decor and function well for years to come. Only downside is that they are on backorder until December. Boo. We also picked out these awesome sherpa throws (in navy!) on final sale! They are SO SOFT! Miles absolutely loves it. We are also going to move the tent up to the room to make it the ultimate big boy bedroom (we've had this one for a couple of years now). Playroom Makeover - a "Boy Cave"
So, this room has had a LOT of makeovers over the years! (You can see photos of the progression of the space here!) However, we are ready to undergo yet another one to make it more suited to being a playroom for the little guys. In fact, we have been referring to it as the "boy cave!" I've actually always felt a little lost about what to do with this space and how to decorate it, but now that we have a true purpose for it, my vision is finally coming together! Getting rid of the brown paint (it does not mesh well with leather sofa.. It makes the sofa look red, which I hate!) We will be repainting the room Benjamin Moore's Polo Blue. One of my all time favorite colors! You can see in the pictures I have already painted a huge swatch on the wall above the couch. Replacing the curtains. I like the West Elm ones that are in there, but they are too feminine for the boy cave. I am thinking I will go with these ones from Restoration Hardware Baby and Child. I already have a pillow in this fabric (see the picture below!) and I love, love, love it! (Anyone interested in buying the old West Elm ones off me? $25/panel for 6-panels! For not a lot of work and not lot a big investment, we can really transform this room to make it more suitable for the role it plays. 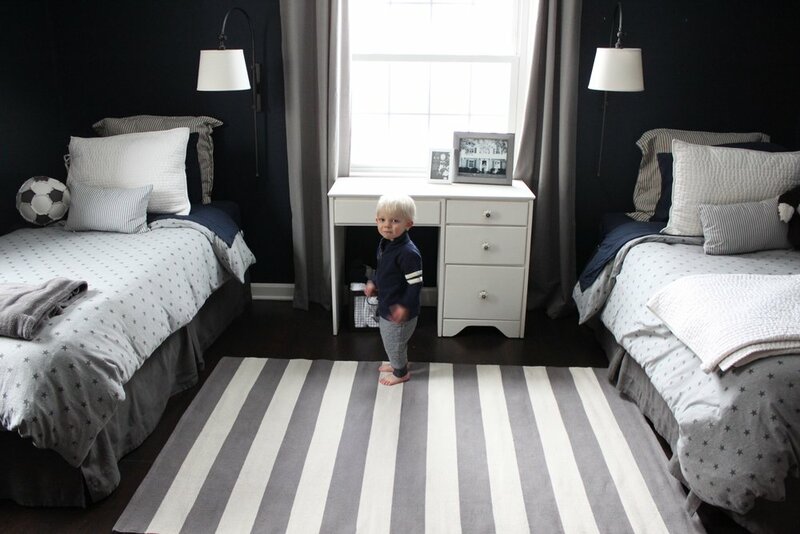 Overall I want to have it have a similar feeling to Miles' big boy room, pictured below. I love repetition in colors and patterns through the house, and having elements that tie everything together. Our latest project was creating baby gates for the top and bottom of our stairs. I will preface this entire post by saying it was WAY more difficult than I had anticipated! Probably one of our most challenging DIY projects to date. There were a lot of steps and it took a lot of patience. However, the gates are SUPER functional - life changing - and I'm so happy with the result! They look good and blend in with the style of our house seamlessly. Additionally, they are strong and sturdy. The store bought ones we used were so ugly and didn't fit well and I never truly had peace of mind. These ones are awesome. At the end of the day, they are definitely worth all of the hard work! 3) Cut two 24" pieces from the 12.5 ft board. These are the sides of the gate frame. 4) Cut ten 24" pieces from the 11 ft board. These are the gate posts. 5) If you have a table saw, use the table saw to make 1/4" tongues on the ends of each post and the ends of the 24" side frame pieces. 6) If you have a router, cut grooves in the top and bottom frame pieces where the side frame pieces and posts will go. It takes time to ensure that the frame is square and the posts are parallel and equally spaced apart. Do not glue the pieces together yet. If you don't have a table saw and router, purchase a pack of twenty 1/4" dowels with a cheap doweling kit (around $5), and use dowels to attach the posts and frame pieces. This will be time consuming but a less expensive alternative to a table saw and router. 16) Close gate and measure where to install latch. Follow latch installation instructions included with purchase. As you can see on our upper gate, we had to get a little creative with the bottom of the gate in order to work around the stair molding. Essentially, we added an extra base piece of trim. Whew! If you read that all the way through, God bless you! Love them, but a lot of work!